The cast of the Arts Club Theatre Company production of The Matchmaker. Photo by David Cooper. 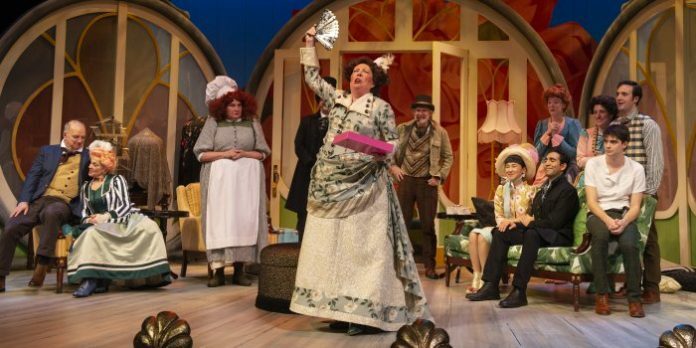 On the outside, The Matchmaker is a bright jewel of a show. 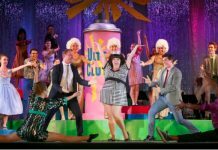 The sets and costumes are stunning, the music is inventive and subtly referential, and there are moments of laugh-out-loud comedy. Upon closer inspection though, the Arts Club’s newest production can’t quite wiggle out from under the weight of its years. The Matchmaker follows the comedic adventures of Horace Vandergelder and his immediate circle on one adventurous trip into New York City. 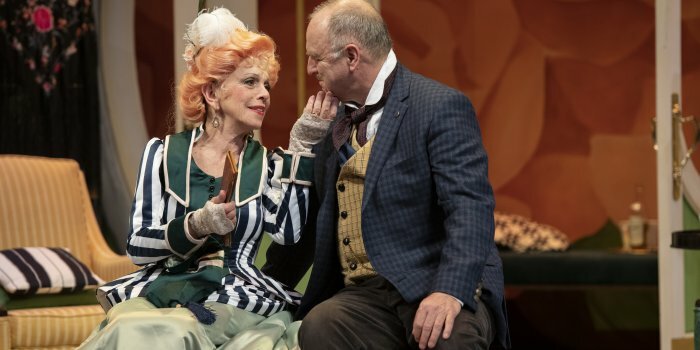 Vandergelder is in the market for a new wife and engages his widow’s old friend Mrs. Dolly Levi, the inspiration for the titular character in Hello Dolly!, to do so. Meanwhile, his niece Ermengarde intends to run off with her artist beau, while Vandergelder’s head clerk hatches a plan to enjoy one last day of freedom before his “promotion” from head clerk to head clerk. The farce ends, as most do, with three happy couples laughing off the adventures of the day and encouraging the audience to do the same. While set in the 1880s, and first performed in 1954, this production does a stunning job of updating the play visually. However, the content remains firmly rooted in the nineteenth century. For example, an early monologue on the role of women in marriage received only a handful of uncomfortable laughs, setting up a wary tension in the room. This dissonance, between dated content and updated design, continues throughout director Ashlie Corcoran’s production. Nicola Lipman as Mrs. Dolly Levi and Ric Reid as Horace Vandergelder in the Arts Club Theatre Company production of The Matchmaker. Photo by David Cooper. The performance styles were a bit uneven with only a few in the cast committing to the necessary heavy character comedy. While Nora McLellan’s Miss Flora Van Huysen became a final inning highlight of the show, others opted for a more subdued sincerity, including Ric Reid’s Horace Vandergelder, causing them to often fade into the floral backgrounds. Nicola Lipman’s turn as Mrs. Dolly Levi struck the most precise balance, with a life-loving hip shake that is endearing. Obviously seeking some diversity on stage, director Corcoran does cast several people of colour. Disappointingly however, these are among the ensemble only. Stand-outs here are Julie Leung’s Ermengarde who is a delightfully childish over-the-top mess, and Munish Sharma’s Cabman is an implacable presence that provides a much-needed grounding to the second-half. Drew Facey’s set and costume design are spectacular, with a self-referential botanical wonderland where his sets echo the costumes, and back again. The architectural styling of the ladies’ dresses with short bustles over mini-skirts and boots, gives them a cheeky modern flair, mimicking the curves at the top of the flats. The addition of a jean jacket under formal wear on the young artist Ambrose Kemper (Nadeem Phillip) brought a nod of hipster chic to this seventy-year-old play. Mishelle Cuttler’s music continued the theme of modern reworkings by riffing on Alicia Keys’ “New York” with a series of brass notes that felt both period-appropriate, yet firmly current. The Matchmaker is a nice physical farce, and while this decades old script doesn’t always hold up, The Matchmaker remains a pleasant relic of a bygone age. The Matchmaker by Thornton Wilder. Directed by Ashlie Corcoran. Presented by the Arts Club Theatre Company. On stage at the Stanley Industrial Alliance Theatre (2750 Granville St, Vancouver) until February 24, 2019. Visit artsclub.com for tickets and information.